Eyelash Extensions should not be confused with strip lashes or party lashes which are little clusters of lashes. Eyelash extensions are semi-permanent, synthetic extensions which are glued one by one onto the natural lash (not the skin) by using a specially formulated glue. With lash extensions, we can achieve a beautiful full luscious and natural set of lashes that you won’t even know they are there. Eyelash extensions if applied correctly will not damage your own lashes and in fact many clients find that the health of their own lashes improve over time. The removal of mascara at the end of the day often damages the natural lashes and can lead to bald spots in the lash line, as seen in most new lash clients. The wearing of eyelash extensions means no more lash trauma, instead the extensions are gently cleansed and the natural lashes are left to do what lashes do best – grow and shed and remain thick and healthy. The growth cycle of your natural lashes can be anywhere from 8-12 weeks so in reality your extensions can last for months. At any given moment, each of your natural lashes is at a different stage of its life cycle - as a natural lash falls out, so will the synthetic ones that are attached. For this reason it’s recommended that you keep your lashes maintained every 2-3 weeks to keep them looking full and the best they can. Enhance your natural beauty and make you feel great about yourself with little maintenance required. Achieve a beautiful full luscious, fluffy and natural set of lashes. 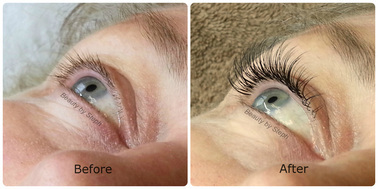 To keep your extensions looking their best we recommend a lash refresh every 2-3 weeks. As long as you have 50% of your extensions remaining we can refresh them to their original glory. Your refresh includes a lash cleanse, removal of unsuitable remaining extensions and ﻿application ﻿of new lash extensions. Eyelash and Eyebrow tinting enhances the general appearance of eyes with the effect of being natural and more defined. It is great if you suffer with sensitivity to make-up and good for sporting activities and holidays when you are in and out of the water.